All right, errbody. Let’s crank up the Macklemore. That’s right. Don’t hate. We can still jam to this song. C’mon, you’re bobbing your head already. As I’ve told you before, one of my favorite things to do here in St. Louis when I have a rare free day is visit a thrift shop or two. Although, technically, these are moderately-priced consignment stores... a little classier than Macklemore’s Goodwill. Who cares, the point is, there are so many antique stores with so many treasures to be had! So last weekend, I carved a few hours of free time to wander the aisles and see if there was anything worth coming home with me. And though I often walk out empty-handed, this weekend... this weekend, I hit the JACKPOT. Last seen, in real life, on a single rainy afternoon during our Italian adventure honeymoon. 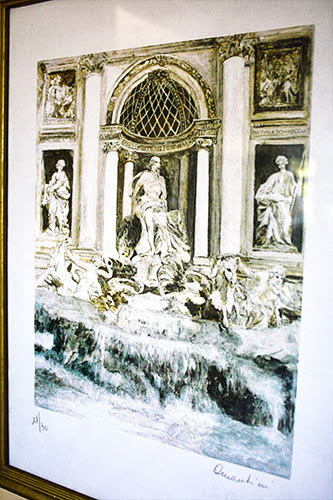 I first spotted the Trevi fountain print and immediately wanted it. Nice size, special meaning, already properly framed in a gold frame (and you know how into gold I am nowadays). 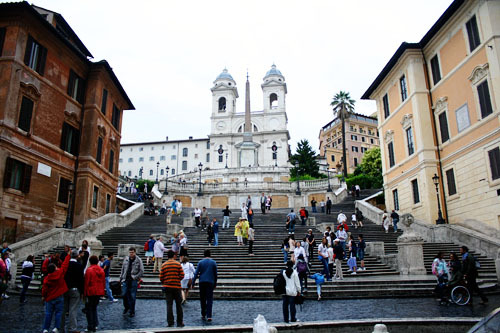 It was only when I reached for it that I realized there was the second print of the Spanish steps. Whoa. Discovering a set of vintage items in thrift store is not unlike spotting a unicorn frolicking with a leprechaun. SO LUCKY. This wall in our foyer has been begging for some art since we moved in. And now that I’ve found the perfect prints, I cannot get over how much I love them in this prominent spot. The perspectives are different, but complementary; the colors aren’t boring, but still on the neutral side. I often end up repeating too-similar prints in an effort to fill large spaces, and these are just different enough to be interesting and eye-catching when placed next to each other. 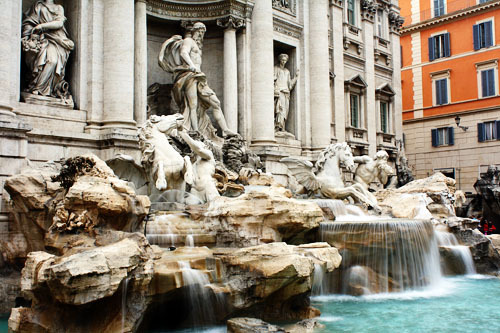 But if you know your Rome landmarks, they make perfect sense side-by-side – just as they’re perfectly connected in the minds of Mr. P and me. Adding to the interest is the fact that they’re signed (in pencil! 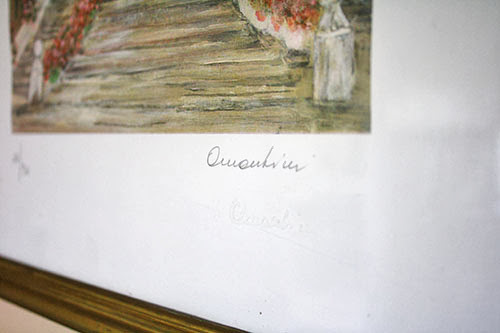 ), with the artist’s signature also embossed on the paper just beneath the one in pencil. Hmm. I can’t really make it out... can you? 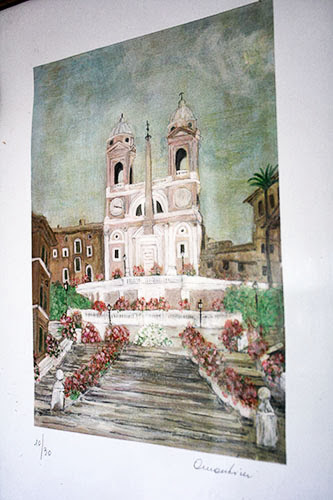 Furthermore, the Spanish steps print is numbered 10/30 (also in pencil); the Trevi fountain is 11/30. 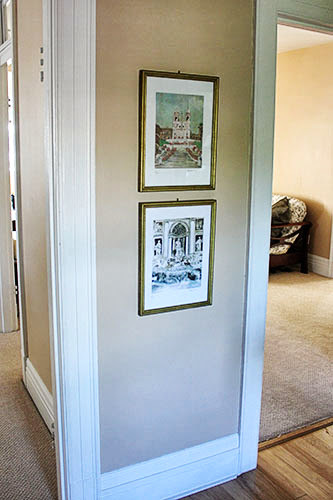 And the prints were actually professionally framed – the backs are covered in that professional-framing paper. So even though I can’t tell who the artist is, it seems like these were well-cared for at one point in time. I’m co-opting them to fit the story that Mr. P and I think about when we see them... but clearly, they have a story all their own as well. But I haven’t even told you the best part. Guess how much I paid for these prints. Go on, guess. Did you guess twenty bucks a pop? Ten? Well, guess again, because I paid LESS. I paid... drumroll... FOUR BUCKS for each print. Four. Dollars. Each. You can’t even buy an intact frame at Goodwill for four bucks! And I got meaningful art, IN A SET, professionally framed, and ready to hang on my wall, for eight buckaroos. I still cannot believe it. I think even Macklemore would be impressed. So now you may understand why I just stand in my foyer staring at this wall now. This is effing awesome. Lately I’ve found myself taking much longer, wider shots of our apartment than I have in the past. I suppose it’s because the apartment is finally starting to come together as a whole – I don’t have to take super close-up shots to cut out all the ugly off to the side. Now if I could only find more four dollar thrift store treasures for the other trouble spots! WOW! 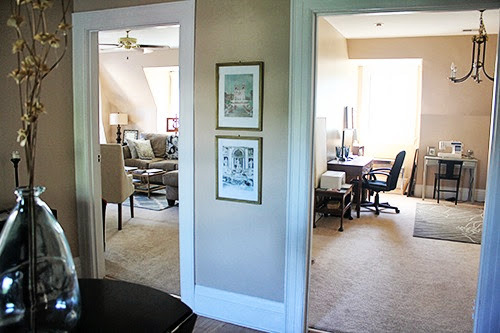 Love the location of the prints but even more I love the story behind those prints!! People used to give me a hard time about thrift store shopping but hey, I found some great items there for a fraction of what they would cost new. I like the wide shot of the foyer and rooms behind too. Keep 'em coming. I love this update. The art work is so pretty, but made even better because it reminds you and Mr. P of a special time. I'm a huge sucker for art that is sentimental or tells a story in some way. Four dollars each! As special as these are, I know you would have given way more. What a bargain find! Were you at the Clubhouse? Wherever, I want to go there, too! @Rachel, indeed! Although, there's a gorgeous print I've been wanting for the longest time of the Philadelphia courthouse dome, but haven't purchased (too much $$$). Every time I mention it to Mr. P, he says, "But we don't have any connection to Philadelphia." Uh, true. I guess I've set such a precedent that he thinks EVERY item needs to be personal! @Tina, these came from Treasure Aisles! I did pick up a few things from Clubhouse Shop this weekend, too. It was a good thrifting weekend! And I said the same thing to Mr. P, that I would have paid a lot more than $4 apiece. Shh, don't tell them!